The mission at the Pope Paul VI Institute for the Study of Human Reproduction is to build a culture of life in women’s reproductive health care. While this mission is headquartered in Omaha, Nebraska, its focus extends well beyond Omaha, and well beyond even the United States. In fact, the Institute’s methods and research are being practiced in communities throughout the world. This is especially true in Poland, where the Pope Paul VI Institute held Education Programs in 2012 and 2013. For Father Piotr Kieniewicz, a priest at the Basilica of Our Lady of Lichen in Konin, Poland, NaProTechnology and the Creighton Model FertilityCare System are providing hope and healing to a growing number of Polish families. “Poland is a unique country in Europe,” says Father Piotr. “While abortion and contraception are certainly being practiced here, there is a growing feeling that we need to protect life. 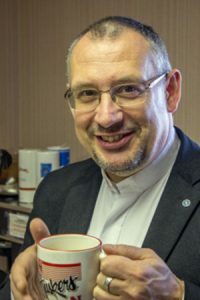 Father Piotr, who was ordained in 1993, has a unique perspective in the area of human reproduction and sexual ethics as he holds a Ph.D. in Bioethics and has also received training in NaProTechnology. With this background, he was asked to manage a center providing Creighton Model FertilityCare System and NaProTechnology services on the campus of the Basilica. The center has seen tremendous growth since it opened, and it is currently staffed by four part-time medical consultants, each of whom has a full slate of patients.